Ouma Johanna Elizabeth Heystek was born in 1873 in the Rustenburg area. She was the second oldest sister, one of nine children who lived into adulthood (two babies died in infancy before Hannie was born, and a younger sister died as a teenager). Her father, Jan Heystek, immigrated from Holland in 1862 and married Anna Maria Erasmus the next year. Hannie grew up in the Rustenburg area on a plot of land where the old school house stood. The Heysteks lived in this house during these early years when Jan was a school teacher (some time between 1869-1879). Hannie’s mother, Anna Maria, kept geese, and the ganders angrily chased the children around during goose mating season. (I have a vidid memory of my own mom’s geese chasing me around!) Anne Marie baked bread in an old clay oven outside the house and sent butter with the kids to the Dominee and the old magistrate, Mr. Brink. There was a beautiful fruit orchard with trees producing oranges, walnuts, pomegranates and dates. Strawberries abounded. According to Hannie’s younger sister Emmie, their father would pull a wagon under the orange trees and the farm workers and the Heystek kids would pick the oranges, which were then kept in a room for winter. The Heystek Familie website mentions Ouma Hannie as being a “pianolerares”, so at some stage during her youth she must have had piano lessons herself to then become a teacher. It is interesting that some of the “traits” of this family stayed around, since my mom became a piano teacher at twenty-one years of age, and I followed in her footsteps. In fact, I am still teaching on my mom’s baby grand piano, the same one that once stood in the spare bedroom of Sieger and Mienie’s house on Lysstraat in Pretoria. Its wood has suffered a few bumps and bruises since its first journey from Germany to SA in 1932 and through numerous moves there, to finally sail over to the US in 1990 and give my husband Keith a few more moving-stiff shoulders in the States. Dankie, Fred. Herman Lampen en sy vrou Geesje is terug Nederland toe na die Boere Oorlog. Hul enigste seun, ook 'n Geert, het wel jare later gegaan na Suid Afrika met die hulp van sy neef Geert (Wijtse se seun) in Rustenburg. 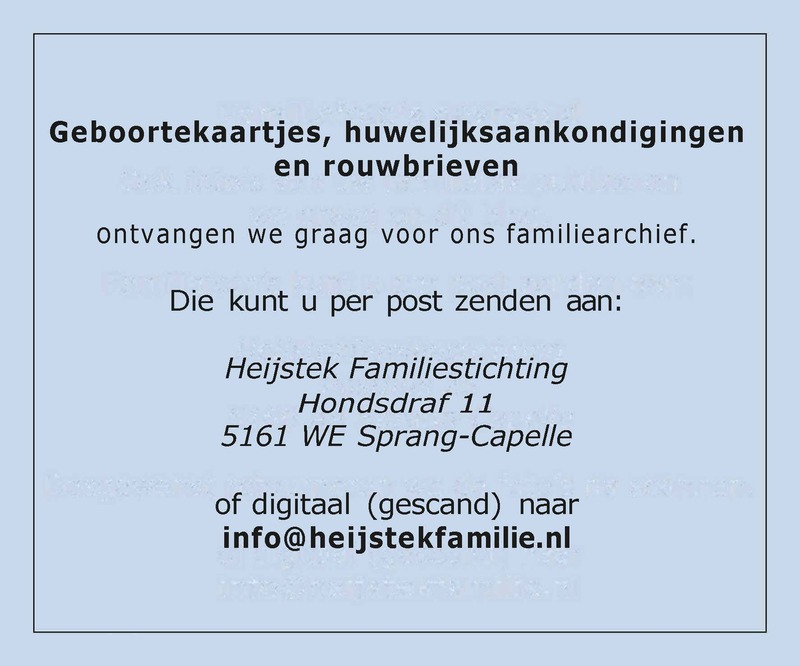 Hy het met 'n Retief nooi getrou en hul kleinseun is vandag deel van ons Lampen Familieblad.